Drip coffee makers are very popular in the US so we've added some basic information, even though this method can deliver the most inferior of cups. There's no big secret to making decent fresh coffee with a drip coffee maker. It's simple and straightforward but there are a few things to keep in mind. Invest in a coffee grinder. When you grind freshly roasted coffee, you increase the surface area of the coffee bean that is exposed to air, hastening the release of the oils that give arabica coffee its rich flavor. If possible, grind coffee right before you use it. Keep your drip coffee maker and coffee pot clean. Coffee oils cling to everything, and once they’re deposited, they eventually become rancid. Wash out the pot and filter basket every time a fresh pot is enjoyed and clean your coffee maker once a week; descale the internals using a bicarbonate solution every month. And, do remember to clean thediffuser head where the water comes out. That’s an area that can accumulate lots of nasty gunk and will taint a freshly roasted, arabica coffee. You’ve probably seen ads for “permanent coffee filters” in gold or nylon. They sound like a great idea and are convenient but coffee residues tend to collect in hard to clean places on them. A better quality brew will be had using a premium paper filter; using a fresh one for every brewing cycle. The biggest mistake made when making coffee in a drip coffee maker is using too little coffee. You should use two level tablespoons of freshly roasted, ground coffee for each 8 (+/- to taste) ounces of water. Measure it out the first few times and you’ll be surprised how much fresh coffee that actually is. Americans got into the habit of using less ground coffee because of bitterness. 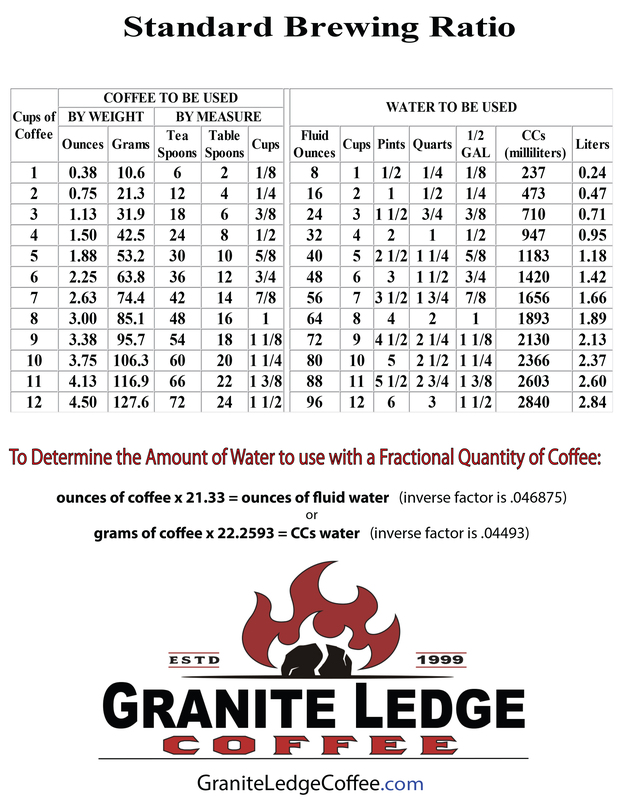 When using Granite Ledge Coffee, fire roasted and fresh, you'll experience no unpleasant bitterness when ground properly. Filtered or spring water is best. Avoid the temptation to use the brew pause. The first cup or so of the brewed coffee will carry most of the flavor. If you pour that off and return the pot to fill the rest of the way, the first cup of coffee will be very strong, and the rest of the pot will be weaker. Take the coffee off the warming plate when it’s done brewing. Once the coffee is done brewing and you've made yourself a cup, pour the remaining into a thermal pot, preferably one with a vacuum seal. If a pot is left on a warming burner, it will continue to cook and swiftly become less palatable. NOTE: If you haven't tried a French Press and you really like a good cup of fresh coffee, we strongly recommend your giving it a try. See the related section within this Library. A glass Chemex or ceramic Melitta 'pour-over' are also very good choices. The 'AeroPress' is a not-so-good idea, in my opinion. We don't like polycarbonate 'plastic' methods because the hot water can cause expansion in the apparatus causing a potential release of compounds that can't be too good for us. In general, plastic when heated is not a good thing where food is concerned. It is said that polycarbonate is safe...I choose not to use plastic where heated foods are concerned. When we want a good cup of black coffee around here, we use "The Press". (Bodum makes the most popular and can be found in just about every discount department store for under thirty bucks). opposed to the grounds taking a quick shower. 2. The 'strength' can be adjusted by allowing the slurry to steep for a longer or shorter period of time. 3. No special electric appliance is needed, cluttering the countertop. 4. The flavor from freshly roasted, freshly ground, freshly french pressed coffee is nothing short of wonderful! 1. Your cup will have some sludge on the bottom requiring it to be emptied and rinsed before refilling. 1. Grind the beans coarsely (see GRINDING page) and add approx. 2 tablespoons to the flask per 8-10oz. of intended water (plunger removed). 2. Add water to about 1" from the top. note: water should be "off the boil" (185 - 195 degrees +/-). make sounds...before it begins to whistle. 3. Take a knife, chop stick or whatever useful to stir and mix into a slurry (this isn't necessary but we think it helps to extract the oils). 4. Insert the plunger/filter assembly keeping the filter part near the top of the flask...do not "plunge" yet. 5. We	let ours sit for 4 minutes or so...sometimes longer because we are easily distracted and sometimes less because we're impatient. No worries...PLUNGE AWAY and enjoy. should be poured. For example, the top half could steep for 3 minutes and the bottom half for 6. Yes, using a press can make your relationship better while adding peace to the universe; building a bridge between coffee lovers who's opinions are as varied as the sizes of rocks that comprise Mt. Washington. I enjoy hiking and camping all around New Hampshire and when alone, typically use instant coffee. However, if I'm with someone or a group, and because I'm the 'Coffee Guy', I'm often called on to stoke the morning fire and get the day off to a great start. To accomplish this I employ Cowboy Mud, along with a chilly morning and the wonderful expectation for a fine day of fly fishin, to set the right tone. 1. Crush some freshly roasted arabica beans on a rock with another rock and brush the handful of fresh grounds into a cooking vessel. 3. Cook it to taste over a fire. 4. Strain it and enjoy. Is this a sophisticated recipe? Nope. But considering the circumstances, it is perfectly wonderful. Like spraying cheese from a can into your dog's mouth, then your own. Like a skewered hot dog dipped in a jar of mustard. Like an expression of love in the tall grass at the edge of a still pond. How you grind your coffee significantly affects the final brew. More so than brewing method but probably somewhat less than water quality. Cheaper grinders (blade and flail style as opposed to well-made burr grinders) don't always have coarseness settings, so you might have to experiment to establish how long to let the machine grind to achieve the right size. But the reality is, flail grinders will achieve an inferior, inconsistent granular. If you want a superior grinder, capable of doing it well, source a burr type (we use a German hand-cranked variety). We recommend "Lehmans", an enterprise located in Ohio Amish country that specializes in quality, non-electric, items. Coarse - Very distinct particles of coffee. Like heavy-grained kosher salt. Downright chunky. Medium - Gritty, like coarse sand. Fine - Smoother to the touch, a little finer than granular sugar or table salt. Extra fine - Finer than sugar, but not quite powdered. Grains should still be discernable to the touch. Turkish - Powdered, like flour. Most inexpensive (blade) grinders will be unable to grind this finely. Generally speaking, "Fresh" Coffee is any roasted whole bean coffee product, preferably arabica, that has not been allowed to sit in temperatures above 32 degrees Fahrenheit for longer than 275 hours (approximately 11 days). The more purist of roasters go as far to say that 90% of the delicious aroma diffuses out of the oily cell structures by 72 hours post-roast. My tasting skills may not be as refined, but I find little difference during the first week or so; but by 12 days, it's lost much of its fresh flavor. 32 Degrees? Should fresh coffee be kept frozen? Yes. If frozen when fresh, whole bean coffee can remain fresh for up to 9 weeks (+/-). Once unfrozen, the clock starts ticking. 2 weeks, the effects of freezing is negligable when compared to the effect when beans are left to degrade at room temperature. How does freezing help keep whole bean coffee fresh? within a sealed container, the aromatics are suspended within, in equilibrium with its components in the frozen oil. So, should Granite ledge Coffee whole beans be removed from the bag and put in a sealed container? to be the most effective vessel. NOTE: Freezing a stale bean just makes it cold. Similarly to bread, if you freeze a piece of stale bread it remains a piece of stale bread once thawed. Some bagged coffee has an expiration date on it. Good thing? I'd bet dollars to doughnuts that the expiration date was many weeks, or even months, down the road and that a roast date was not included. If this was the case, then an expiration date is both not useful and misleading. Remember, the available shelf-life is at maximum, approximately 11 days of real room temperature "freshness" and approximately 9 weeks if frozen. An expiration date is only useful when used in conjunction with a roast date. Granite Ledge Coffee roasts daily and delivers fast. Fresh! What is "fresh" really? What makes coffee so noticably superior when it is fresh? weight of the bean that is gaseous carbon dioxide. Once gone, less favorable flavors remain. CONCLUSION: Only buy fresh beans; no more than you'll use in a month or so. Freeze them in a sealed container and grind them just prior to use. Similarly to bread, it is better not to freeze coffee if you'll use the beans in short order. However, for short periods of time, freezing coffee will in fact retard its degradation allowing you to buy more at lower cost.